This week has been very…exhausting. I got into work on Wednesday and my cook tells me the oven is broken. You know, we only use it THREE TIMES A DAY…EVERY DAY. I was then informed we were out of flour, and sugar, but not before returning with the flour was I made aware of the sugar…so I made 2 trips to the grocery store all before 10am. Plus side: I wore ballet flats versus heels. Yesterday, there was a diabetic education for a newly diagnosed diabetic on the floor, and lunch was the busiest day yet. By 12:30, my batch of guacamole (48 avocados worth!) was GONE and we were running out of fajita vegetables so I was sporting my hairnet, apron, and red heels while chopping away like a mad woman. In the afternoon, my cook pointed out ice accumulation in the walk-in freezer, so it was on to calling maintenance to take a look. Kitchen, please don’t fall apart on me! I was also informed that $800 was taken from my budget for a patient’s lost dentures. SERIOUSLY?! Maintenance then informed me that a shelving unit we placed an order for was incomplete and came with no posts. I was on to that project. I then had a meeting about childhood obesity programming and was told I need to have a program plan established and ready to present to the physicians in less than 2 weeks. I’ll get right on that! I had one out-patient scheduled yesterday, which of course, was scheduled from 2-3pm…just like my staff meeting. I had to reschedule the patient who, of course, could only come during the ever-hectic lunch hour. It was just one a few of those days. And despite all that, I forced workouts that I surely didn’t regret and could come home to decompress in the kitchen. After a stressful day’s work, I find solace in my kitchen. My solace would be all the better with my own personal dish washer (and let me tell you, I dirty enough that my cooking warrants one! ), but I’ll continue to work on training Mr. Prevention in the mean time. We’re currently working past, “Where does this belong! ?” Small steps…baby steps. I figure a helper with dishes is also warranted when I put meals like this before my jalapeno-loving other half. To say this was a hit it quite the understatement. 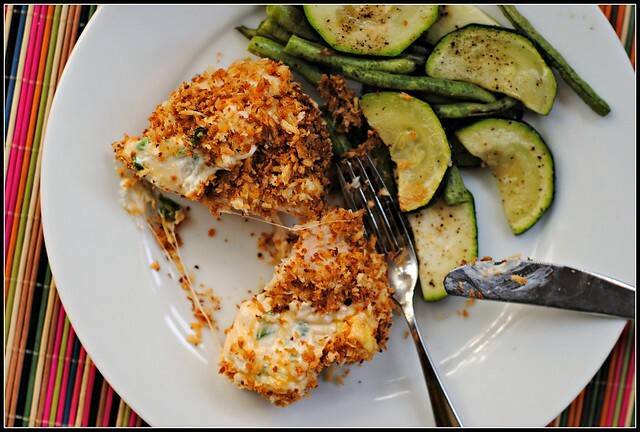 Cheese and jalapenos in a panko encrusted chicken breast? Nothing not to love about that..including the nutrition stats! 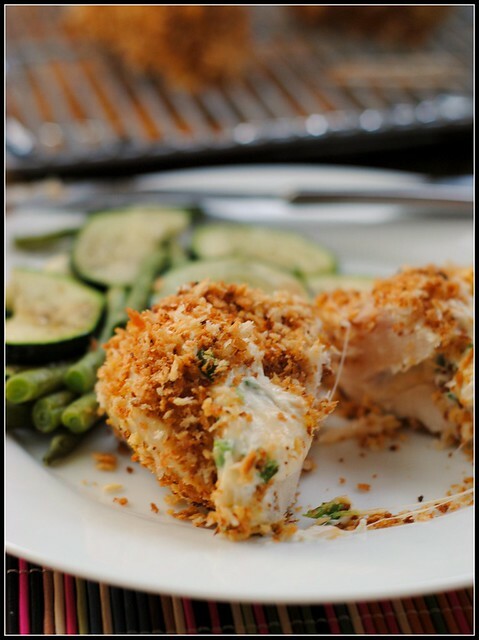 Jalapeño Popper Chicken highly adapted from Allrecipes, by Sunny Side Up in San Diego, as seen on Elly Says Opa! Preheat the oven to 375 F. Place an wire cooling rack onto a rimmed baking dish; spray with cooking oil. In a small skillet over medium heat, combine the panko and oil. Cook, stirring often, until the panko is golden and crispy, about 5 minutes. Remove to a shallow bowl. To the panko, add the taco seasoning and stir to combine. In another shallow bowl or dish, lightly beat an egg. In a small bowl, combine the cream cheese, cheddar cheese, and jalapeños. Using a small knife, cut a pocket into the side of each chicken breast. 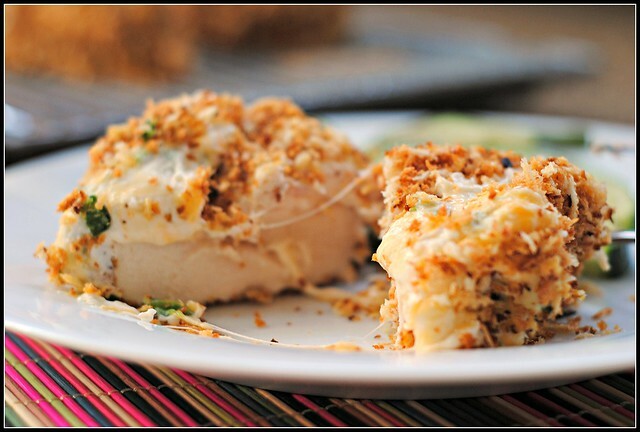 Divide the cream cheese mixture evenly between each chicken breast’s pocket. Use toothpicks to secure, if necessary. Dip the chicken pieces one at a time first into the egg, and then into the panko mixture, making sure to coat the chicken completely. Place the chicken on the prepared baking rack and cook for about 25-30 minutes, or until chicken is cooked through. Result: A huge hit! Toothpicks are definitely helpful to secure all the goodies, but these were simple and the taste was phenomenal. Mr. Prevention loved these! Add more or less jalapeno to suit your heat preference. Reheat in the oven for best results. Enjoy! Hoping for a relaxing day and evening. I think I’m declaring it date night. I have several place I’d like to try around town 🙂 TGIF! Just reading about your hectic day makes my head spin! I hope you have a wonderful & relaxining weekend!! Oh man… I HATE days like that. They’re so exhausting! Luckily, it’s just a few days like that here and there and hopefully your kitchen is up and running efficiently from here on out! I am exhausted just reading that! I had a week like that about a month ago so I can certainly relate. Hope you have a really relaxing weekend to unwind! Good thing you have a recipe as awesome as this to curl up with! Thank goodness this week is almost over! I hope your weekend is better than your week has been. I don’t know how you do it Nicole! You had me at jalapeno on this one. Enjoy your weekend! I am sure you are MORE than ready for the weekend. Hang in there! Things can only get better, right?? And until then, you have this delicious chicken to enjoy! Wow, you are one incredibly busy lady! I hope you have a relaxing and calm weekend to make up for it 😀 This chicken looks absolutely incredible. I think I’d be making it for myself(since I’m not sure if anyone else would enjoy it), but this is going on my list to try. I can’t get over how awesome it looks! Made this for dinner, YUM! Used pickled jalepenos since I had no fresh and they were really good! Nice to know since I always have the pickled ones and they don’t go bad. TGIF! Pour yourself a nice glass of ice cold beer and enjoy the weekend. I made this for dinner this week, too. We really enjoyed it and I might have to make it again next week since I find myself wanting it again. This chicken sounds amazing. I’m a little jealous of Mr. Prevention and all the amazingness you cook for him. Oh my….just reading about your days has me feeling anxious and exhausted! This chicken looks and sounds fabulous however! Have I said congrats on the cookbook?! I have been quite out of touch recently. (in the process of moving/my dog had emergency surgery/no internet for DAYS….and the list goes on!) Sounds like things are going great for you! Busy…but great! Sounds like you’re ready for a weekend! Hopefully your weekend will be a lot better than your week – can’t be much worse, right? And, you have this delicious chicken to enjoy! Your job sounds like mine! Minus the broken oven… Mine this past week was roaches in exam room 8. And two staff members screaming at each other. Sigh. Sending big sympathy hugs! SO impressed with this gorgeous recipe!! This chicken looks really good! I can’t wait to try it. I hope this next week treats you a little better. Food service is unpredictable. Love this one! I wanted to let you know that I bookmarked you (again) stop by and check out my “What I Bookmarked” post. 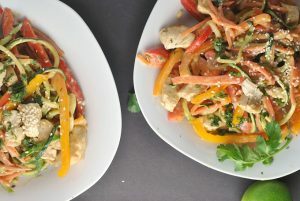 LOVE this chicken dish – looks super tasty and delicious. Great flavors! We are making this one tonight! Question: I see that you have this recipe twice on your website with minor differences. 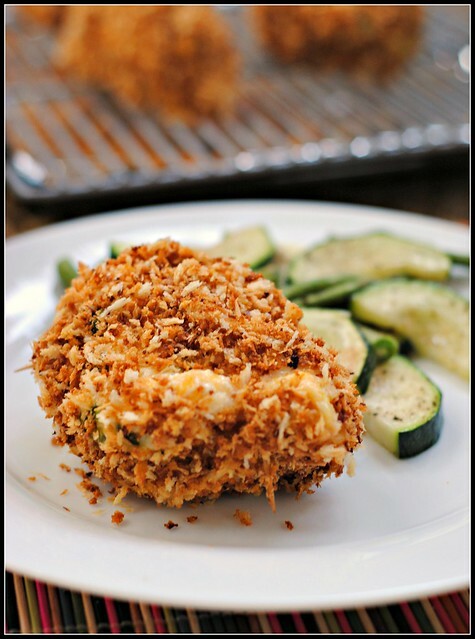 You cook the panko beforehand in this recipe compared to the older one. I am assuming you prefer this newer recipe to the older one? 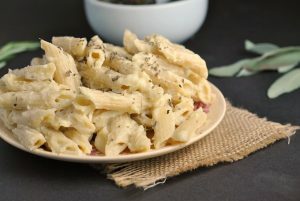 Love your website and all the recipes btw – awesome stuff!! Thanks. I made this for supper tonight, and it was incredible! Thanks for the recipe! just made this for the family and everyone loved it was super simply to make and yummy! !